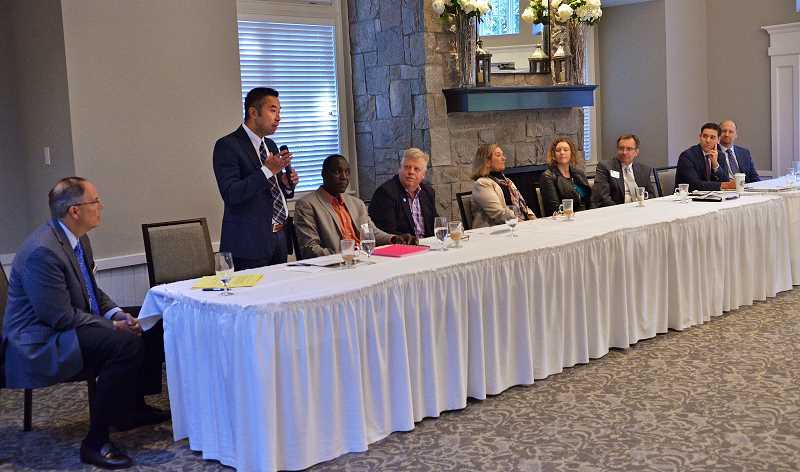 Seven of Lake Oswego's eight City Council candidates and two Senate District 19 candidates gathered at the Oswego Lake Country Club on Tuesday morning for a forum hosted by the Chamber of Commerce. It was the first of at least five candidate forums scheduled in Lake Oswego between now and the November general election. Council candidates Randy Arthur, Emma Burke, Jackie Manz, Donald Mattersdorff, Massene Mboup, Daniel Nguyen and John Wendland were joined by state Sen. Rob Wagner and challenger David Poulson. Council candidate Hannah Crummé was unable to attend. With nine candidates in the mix, there wasn't a lot of time for back-and-forth, but moderator Keith Dickerson kept things moving with brief introductions and just a few questions. The candidates were also given time for brief introductions and concluding statements to make their case to voters. 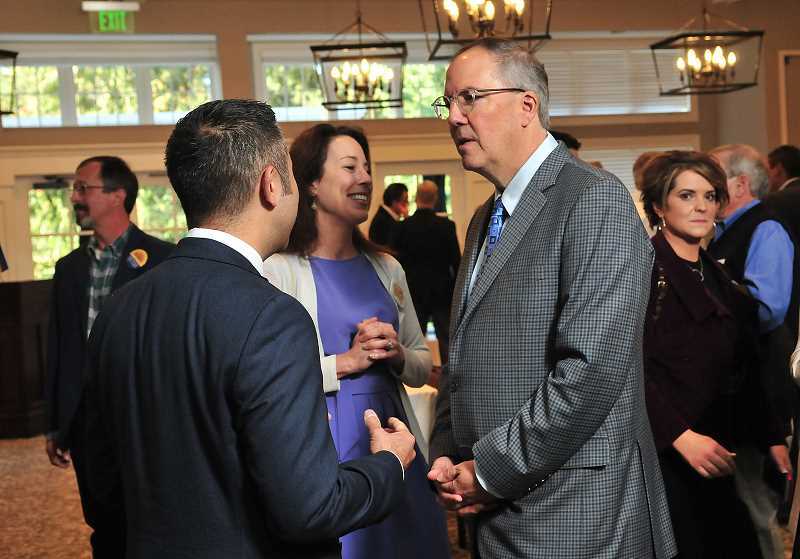 The questions focused on business issues in Lake Oswego; one asked candidates about their vision for how the City could spur economic development, while another asked how they would approach the North Anchor project if current plans were to fall through. The final question asked the council candidates about their vision for Lake Grove and how they would close the gap between available funding from the Lake Grove Urban Renewal District and the total amount needed to complete all of the phases of the Lake Grove Village Center plan. Wagner and Poulson fielded a separate question about parental leave policies for small businesses. 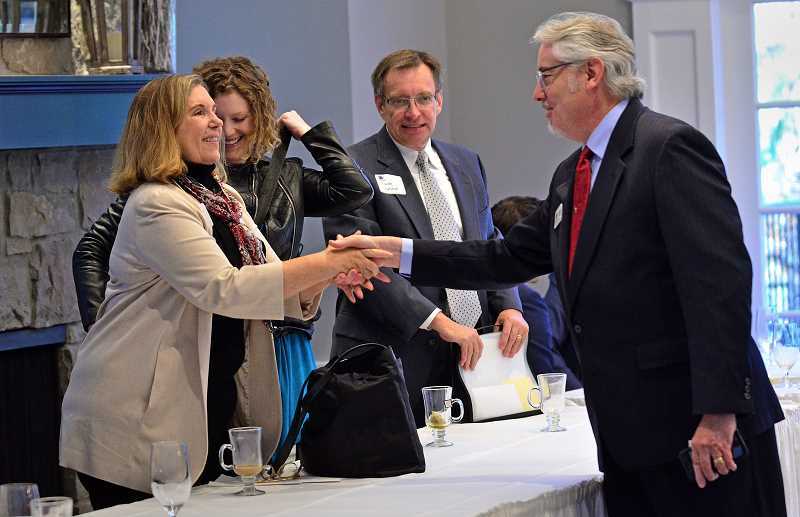 Poulson called support for growing families his "prime directive," and said he supported state-led efforts to help small businesses provide family leave — although he cautioned that such programs could be vulnerable to fraud. Wagner discussed a proposed piece of legislation that would create a family medical leave program in Oregon, with contributions toward the cost from both employers and employees. He noted that the U.S. is one of only a few countries worldwide that doesn't offer guaranteed parental leave. During the council portion of the forum, Wendland said he didn't think the City should give up on the current North Anchor plan, noting the amount of time and effort that has already been put toward a project that is supposed to include a boutique hotel and either offices or apartments. But he said he was confident that a new partner would emerge if the current deal fell through. 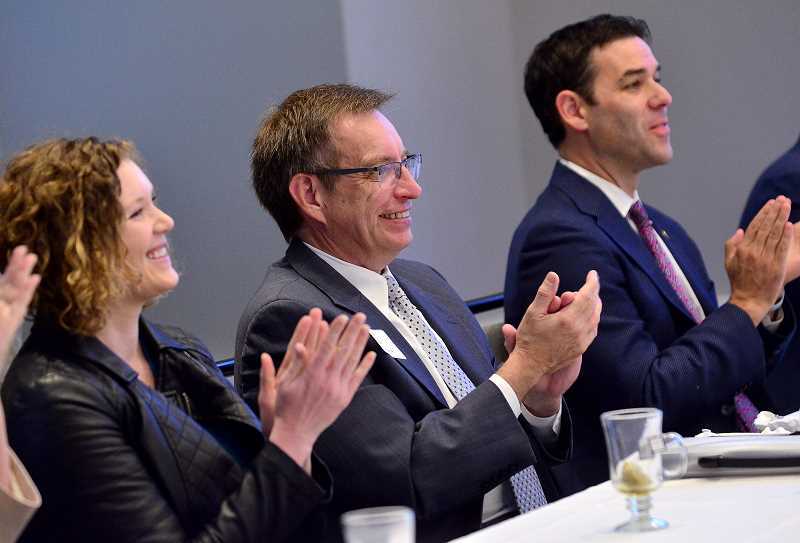 Wendland also noted that the Lake Grove Urban Renewal District has overperformed relative to its original expectations, and said he would support increasing it to cover the remaining needed funds. "The council could approve — and I would support — an increase in the Urban Renewal District by 20 percent," he said. He praised the performance of the council in recent years, attributing its successes to a sense of congeniality among the group that he said he hoped to be able to help maintain. Nguyen called for the City to abandon the current proposals for the North Anchor project, arguing that the original Request for Proposal phase of the project was flawed because only one proposal was ever fully entertained. He said a revised plan for the project should focus on setting more specific deadlines and milestones for the development process. Nguyen said he would consider expanding the Lake Grove Urban Renewal District in order to fund remaining projects and, as a restaurant owner, said he understands the need for adequate parking and the impact it can have on businesses. He also discussed his decision to run for council as a parent and small-business owner, saying he hoped to be an inspiration to other residents. "I want to be able to help encourage people to step up, to get involved," he said. "I want to say, 'Yes, you can do this.'" Mboup said he wanted to see the City follow through on the future phases of Lake Grove's development, matching the level of commitment the City has shown to revitalizing the downtown area. He suggested that the City should work with the Chamber of Commerce to spur economic development, and said that he was open to exploring other options for the North Anchor space. He also said he wanted to pursue policies that would help employees at local businesses. "I will work for our workers," he said. "Lake Oswego is only great because we have great workers." Mattersdorff said he would support hearing from competing offers for the future of the North Anchor project, even if they diverge from the project's original plan. He suggested that City planners could look to the downtown area for examples of the type of public-private projects that could be used to solve parking issues in Lake Grove. He also suggested that the City try to find a way to close the Lake Grove project's budget shortfall without placing an additional burden on taxpayers, citing the new Operations and Maintenance Center as an example of the correct approach. And he said he wanted to see the Lake Grove area receive the same level of investment as the east side of the city. "To my eyes, the western part of the city is growing at a faster pace," he said. Manz said the City should continue to utilize public-private partnerships to spur economic development. She said the City has a number of options it could consider to fill a funding gap in the project's later phases, but said that any decision would need to include substantial citizen involvement. She said that market forces would need to play a role in determining the correct use for the North Anchor space if the current deal falls through, but stressed that parts of the current project are badly needed in the downtown area. "I'm in full support of a boutique hotel at the very least," she said. Burke placed a strong emphasis on citizen involvement in her answers; when discussing the possibility of a revised North Anchor project, she suggested that a new round of public outreach should be conducted because of the amount of time that has passed since the previous version was developed. "If it does fall through, it's time to give new residents and the community another chance to give input," she said. She also discussed her role on the Lake Oswego School District's Diversity, Equity and Inclusion advisory committee, and said she wanted to serve as a conduit for younger parents to become involved in Lake Oswego's government, hopefully spurring a level of involvement closer to the level seen in the LOSD. Arthur discussed his own work on the Lake Grove Urban Renewal District plan as a member of the Planning Commission, and said he would support extending the debt capacity of the district in order to ensure that all three phases of the Lake Grove plan are funded. He said the City needs to take the lead on economic development and emphasized the importance of public involvement in the City's processes for developing new projects and plans. He also said he supported working to bring about the vision that the Lake Oswego Redevelopment Agency board originally created for the North Anchor. "The North Anchor is a second gateway to Lake Oswego," he said, "both a civic center and an economic stimulus for our town." Additional upcoming forum events include a Clackamas County Democrats forum on Sept. 30, a "Speed Date the Candidates" event hosted by the FAN/Forest Hills Neighborhood Association on Oct. 1, a forum hosted by the group Respond to Racism on Oct. 8 and a forum hosted by the Lake Oswego Review on Oct. 18.